The lunch club is the greatest thing since sliced bread. With an emphasis on local and organic produce whenever possible, the vegetarian lunch club is based on the shared responsibility for the meals in the office. Each member (there are 8 of us) is in charge of bringing lunch for their fellow “clubbers” once every other week. Simply put, you cook once and you get to eat for two weeks (Fridays are for leftovers). You do the math. It saves us time & money, not to mention that it’s a tasty way to build a sense of community in the office. Personally, a large part of the enjoyment I get from cooking comes from doing it for others. I love the sharing of food, and the care that comes with it. The human relationship with food is, after all, an emotional one. It is through food that most of us have been comforted since early childhood. Given that I’ve only got myself to feed on a daily basis, I do tend to get lazy and settle for quick and repetitive (albeit creative!) variations of a spinach salad time and time again. That’s also why the lunch club is so great. It gives me an excuse to try out new recipes that I may not have otherwise spent the time doing for myself. This week’s recipe was incredibly well received by the club. And thanks to my roommate and her professional lighting equipment, I had what seemed like an actual photo shoot happening in the kitchen on Sunday night! Steam or boil the asparagus and green beans, set aside. Cook soba noodles according to package directions. Rinse with cold water and drain thoroughly, then put in a medium bowl. Add the watercress leaves, the scallions, the edamame, the asparagus and the green beans. 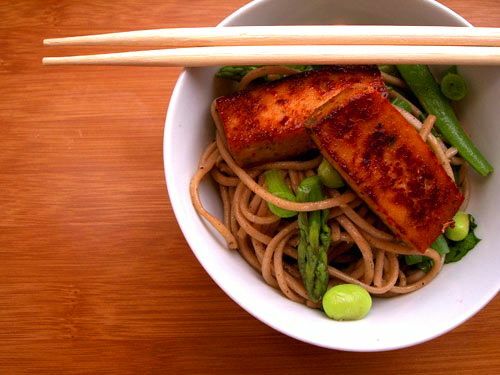 In a small bowl, whisk the sesame oil, soy sauce, ginger, half teaspoon of the salt, and the pepper and toss with the soba and vegetables. Cut the tofu into slices. Lay them on a plate and sprinkle with the remaining salt and the cayenne. In a large sauté pan, heat the olive oil with the maple syrup over medium-high heat until the mixture starts to bubble. Place the tofu slices into the bubbling syrup. Cook for a few minutes on each side. Use your spatula to scoop the maple glaze over the tofu as it cooks. When the tofu is golden brown and most of the liquid is absorbed, remove it from the pan. Serve a cup of noodle topped with a few tofu slices. Can be served chilled or warm. Serves 4. Recipe adapted from Robin Asbell’s New Whole Grains Cookbook. This looks fantastic! I think I may try it this weekend! Keep posting, your recipes are mouthwatering! It’s beautiful and sounds really delicious. One more book I need to get! Hello! This looks SO GOOD! How long does this take, prep-time wise? Thanks and LOVE your blog! I am just learning to cook and discovered your wonderful recipes! I'm glad you enjoy the blog – thanks for your comments! The salad itself is pretty quick to put together. It's the tofu that takes awhile because I had to sautee it in batches. Give yourself at least 45 minutes to an hour for the whole recipe. Good luck, and let me know how you like it! This dish looks delicious. Thanks for sharing!